People in less affluent parts of the country spend more as a proportion of their income on Christmas, analysis by the BBC indicates. The North East, West Midlands, Northern Ireland and Yorkshire & Humber spend 25% of a month's disposable income. But in London and the South East, that falls to below 20%. The analysis by BBC 5 live's Wake up to Money podcast matched official regional income figures with Centre for Retail Research spending forecasts for Christmas. Will you feel the pinch this Christmas? Separate figures from YouGov show wealthier people are cutting back on Christmas and plan to spend less on gifts this year, down 8%, at £300, compared to £291 for lower earners, up 4%. Anecdotally, we found parents in less affluent areas spending far more on their children's gifts. We asked shoppers in two very different towns, Kirkby in Merseyside and Wilmslow in Cheshire, about their Christmas budgets. Kirkby is in Knowsley, a borough which is ranked as one of the most deprived in England on measures such as income, employment, health and education. Wilmslow is part of Cheshire's so-called "Golden Triangle", an affluent area known for its expensive houses and famous footballers. In Kirkby, parents said they were spending anything from £100 to £1,500 per child. Their counterparts in Wilmslow often had smaller budgets, from £30 for a baby to a maximum of £300 for teenagers. 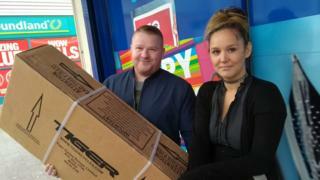 At Kirkby Shopping Centre, father-of-five Scott Gavin said: "I try to stick to £400 [each]. It won't happen, it never does. We've got our own business so we earn good money." A woman with four children said she spends as much as £1,500, blaming "iPhones and perfume", while a father of six has a similar budget. He said: "As the kids get older, it gets more and more expensive. I think it's more the parents that push it more than the kids expect it. And I'd rather give than take, do you know what I mean? I'd rather spend my money on the kids than spend it on myself." A number of people with young children said they were spending £100-£300. Estelle Carroll said: "I've spent about £300 on my son this year. He's 16 months. He was ill last Christmas, he had bronchitis, so he couldn't celebrate it, so this year I'm making up for it." Her friend Stephanie Hasalamaj said her limit was £150. "It's entirely up to people what they want to spend on a child but I don't think they appreciate it if they get loads and loads of toys. Because as they get older they just expect more." Over in Wilmslow, no one gave a figure above £300 per child. At the upper end, Andrew is buying for three children aged, 12, 16 and 18. He said: "I'm not very good with budgets, and I'm a little bit more nervous this year about spending, because things feel like they're tightening up a bit. "We'll probably spend a couple of hundred on each, but they want upgrades on their iPhones as well and sadly they don't think that's part of Christmas, just part of life." A few women with young children said they were spending less than £100. Jessica, mother to a two- and four-year-old, said: "We're trying to stick to £50 per child because we feel they have so much stuff and they get so many gifts from other people." But Jenny, who as a Muslim is not buying for her children, suggested that many people could be spending far higher amounts. "We live in quite an affluent area, so it's Fitbits, it's iPhones, it's the latest computers, it's these hoverboard things, it's all the latest electronics. But it's not just one main present anymore. It's three or four," she says. So what explains this different approach to Christmas spending? Prof Sir Cary Cooper, a psychologist at Manchester Alliance Business School, thinks the variation might be connected to other financial obligations, and could also be a legacy of the recession. He said: "If you look at middle-class people, they have lots of other costs, like private schools and private healthcare. They're well-off but not what I would call rich, they've often got heavy outgoings. "And from a working-class perspective, they've had a rough time since the recession and probably couldn't spend as much then. Now they're back in employment, they're making up for lost time." No one we spoke to in Kirkby and Wilmslow said they planned to use credit, but figures from the Money Advice Trust suggest it is playing an increasing role. The trust, a charity which runs the National Debtline, polled 2,000 people and found 37% are putting Christmas presents on credit. That's up from 33% last year. Price rises - is the worst over?